Day 10 of Lamb & Lion Ministries 2009 Israel Tour was ripe with possibilities, as it was our free day to go anywhere and do anything (legal) that we wanted to do in Jerusalem. And indeed we did. Some followed Dr. Reagan up to walk the old walls. Others followed Shai into the dark, watery tunnels of Hezekiah's Tunnel. Some shopped till they dropped. And others of us journeyed to the Temple Mount. 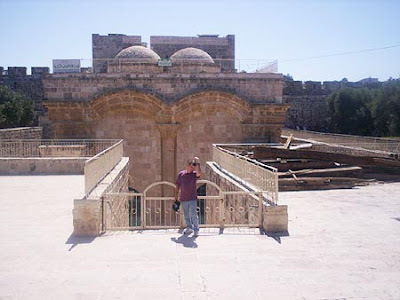 I was part of the Temple Mount group. The center of world religion is focused on that platform on Mt. Moriah, and I wanted to be at the very place I'd been read to since I was at my mother's knee. It is also where all of us believers are going to be spending a lot of time at over the next 1,000+ years. While our families get ready for bed, our day begins here in Jerusalem. This view from the hotel room shows the uniformity of the buildings. 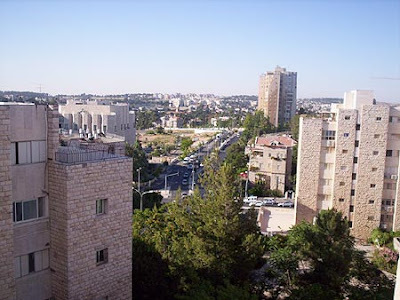 The city requires that Jerusalem stone be used on all the outsides of buildings to give it that ancient retro look. Bullets also bounce off the odd angles of the stones. 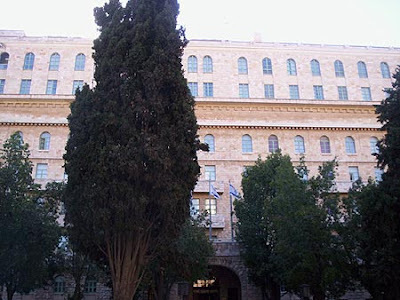 The best hotel in town, and where we didn't stay, is the King David Hotel. The floors of the lobby are etched with dignitaries from all over the world. It is here where Menachem Begin drove the British out of Israel. 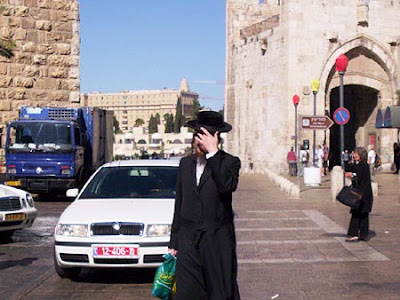 This poor Orthodox Jew! I was really trying to take a picture of the King David Hotel by way of the Jaffa Gate. 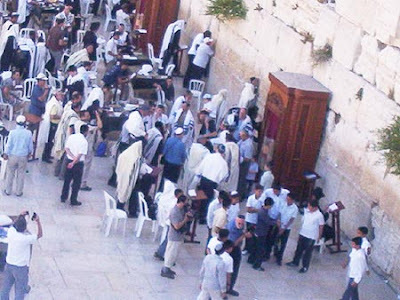 Four bar-mitzvahs were being held simultaneously at the Western Wall. The 13-year old boy reads from the Torah scrolls and then becomes a man. 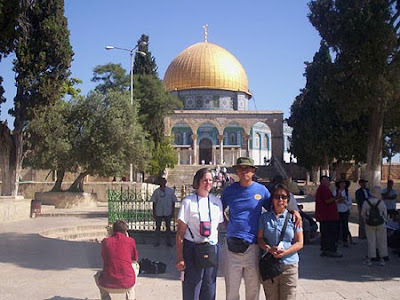 Judy, Andrew, Suzy and I are admitted up to the Muslim-controlled Temple Mount during "infidel hours." Capitals from the columns of Herod's Second Temple are all that remain after the Romans obliterated it in 70 AD. 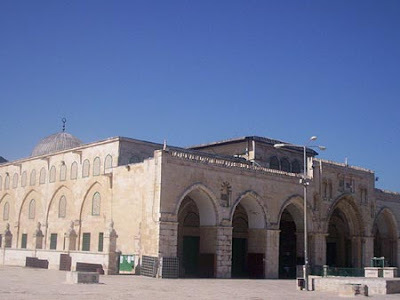 The true mosque on the Temple Mount is the Al-Aqsa Mosque. 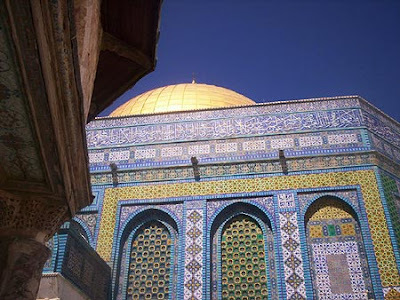 The Dome of the Rock is more there for ceremony. We were wondering what kind of reception the Muslims would give us up on their third most holy site. Generally, they ignored us. Police lounged around and children played games. Jackhammering going on under the tents. 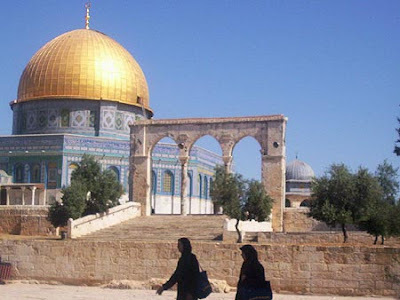 The Dome of the Rock sits on what many believe is the original site of the Temple. Most likely, it sits where the Court of the Gentiles once was. "Jerusalem will be trampled on by the Gentiles until the times of the Gentiles are fulfilled" (Lk. 21:24). Yes, that's solid gold on the dome. And look at how many little mosaic tiles there are! We were amazed that we could make it all the way to the front doors. 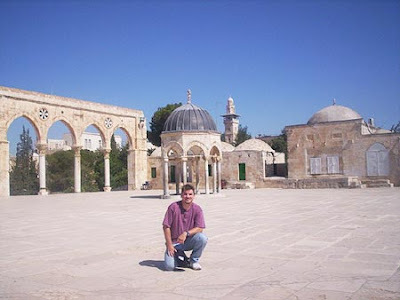 I am most likely standing very near the exact spot where the Holy of Holies once stood, and will again. This parcel of land is the most sought after, most expensive land in all the world. We walked up to the back of the Eastern (or Golden) Gate, the gate Jesus entered the city during Palm Sunday, and will again at His Second Coming (Ezek. 44:1-3). 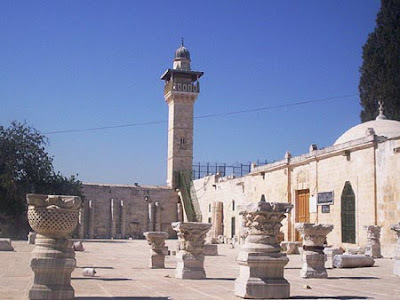 The Muslims under Suleiman the Magnificent in 1517 sealed the entrance and placed a graveyard in front of it to deter the return of the King. 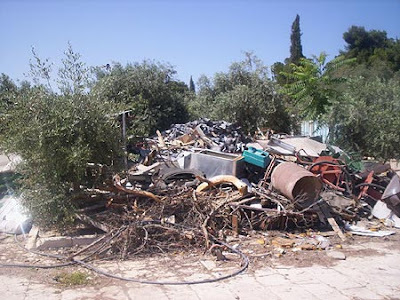 As we discovered, they went the extra mile since behind the gate is now a garbage dump. When Jesus returns through the reopened Eastern Gate, should the layout of the ramp be the same, He will pass right where I'm standing, and we who return with Him will be following (Ps. 24:7-10). The various groups happened to be drawn together to this little outdoor cafe for some much need ice coffee pick-me-up. 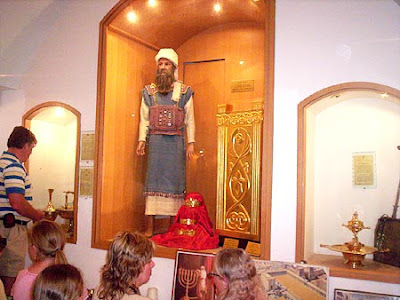 What you are seeing here at the Temple Institute is the actual high priest's garb and other items they plan to use when they can rebuild the Third Temple, the one the Antichrist will desecrate (Dan. 9:27; 2 Thess. 2:3-4). A fascinating talk with their tour guide revealed how different the Jews view God and the Temple than Christians do. 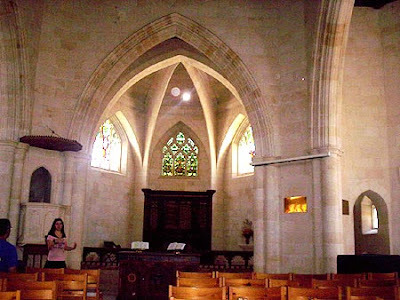 We next visited Christ Church, the first Protestant church built in the Middle East in the 1830s. The spiritual and political effect of this church put Jerusalem back on the map. The highlight of the day was our conversation with our Messianic Christian tour guide, Hadar. Her testimony of how she came to know the Lord over the Internet and what the 15,000 Messianic Christians in Israel have to give up and suffer for moved us deeply. Our prayer time with our sister-in-Christ from the other side of the globe was very meaningful to us. I ask that you, too, will continue to pray for Hadar and the other Messianic Jewish people in Israel. Lavendar and rosemary, which the Israelis use in plenty in all their landscaping, is a great aromatic idea. Don't eat the fruit from the Arab market - ever! There's only so many shofars (ram's horn trumpets) one man can buy. Our evening ended after dinner with a special ceremony. We have plenty of devotions and good Bible teaching from our four teachers on this trip, but tonight had the additional fun of being an awards night. Dr. Reagan gave out cards for such categories as the "Gold Plated Character Award," the "Special Endurance Award," "Good Shepherd Award," and many others. The teens on the trip cleaned up on many of those. We got to share our special thoughts about the trip and what has impacted each of us, and all agreed what a wonderful crew this was to share these adventures with. The final two days of our tour will fit in some exciting biblical spots. 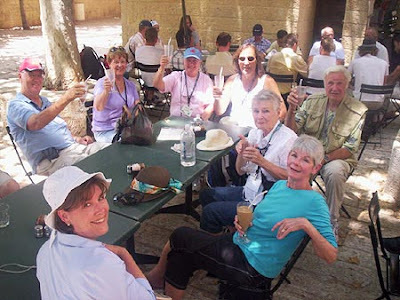 God willing, on Day 11 we will hold a special worship and communion service at the Garden Tomb and visit Golgotha. 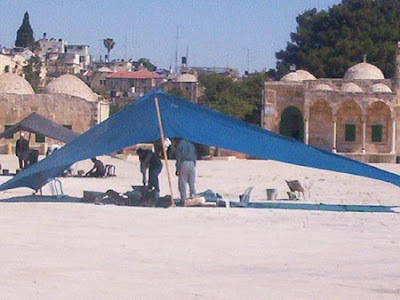 We will move on to what was Kireath Jearim where the Ark of the Covenant was stored in a farm house for 70 years (1 Sam. 7:1), and where Elvis lives on in the hearts and gas pumps of the locals. We may even visit the Valley of Elah where David fought Goliath. And hopefully, we will get all this in before heading to the airport for the toughest part of this trip - Day 12 and the loooong flight home. For some, it was the trip of a lifetime. For others, a valued learning experience. But, for me, it was a worship experience, for I got to fellowship with my new-found brothers and sisters in Christ in the echoes of my Savior's time here on earth. 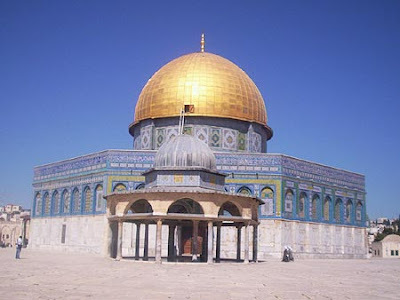 As it stands today, the Dome of the Rock is a complete and utter abomination in the eyes of our Holy God. 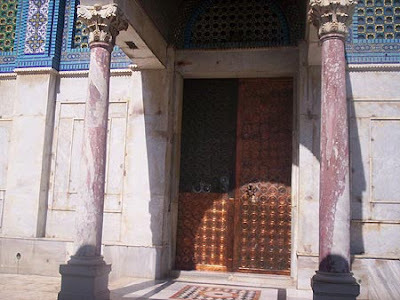 Inside that horrid structure are written all kinds of blasphemies against YHWH from the Qur'an, including the direct denial of Jesus Christ as the Son of God: "Far be it removed from His [Allah's] transcendent majesty that He should have a son." The sorriest thing I read was the garbaage dump behind the Eastern Gate. So sorry. I look at my picture of those gates and know that I will one day be there with our Lord. When I went with Dr. Reagan, I received two awards. I still have them. One for "Outstanding achievment in luggage identification", and the other "The Frankfurt wrong-way-train award". Neither one should I have been proud of, but great FUN. I have a feeling that when the Son of God returns, these feeble attempts at blocking His entrance will simply cease to exist at His approach. In a visual sense, I see the cleansing wind that blew through the theater at the beginning of the movie Phantom of the Opera, only this will be a wind of light that just wipes the junk and bricks away. No Biblical support for this, of course. Just an nice visual. Nathan: pencil in your calendar for the spring of 2015. If Christ doesn't return between now & then, let's plan a 2 week pilgrimage for our families and children to Israel. this blog is one of the greatest blessings on the internet! 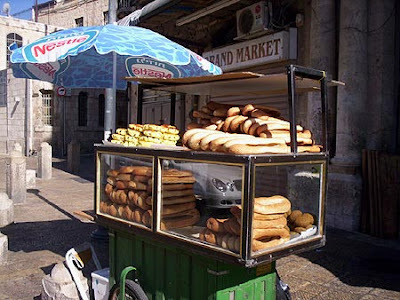 it's wonderful to see Israel through L&L's eyes! I was really surprised to see how close you could get to the Islamic "holy sites" on Mt. Moriah. I'd've thought some guy with a green headband and a scimitar would be standing there barring the way. Shows what I know. As for the Eastern Gate, I'm astounded at all the work the Muslims have gone through to block the way of a Person they don't even believe in. Are they just hedging their bets, just in case there is something to this Jesus being Messiah and returning to earth thing? Hey Nathan: You did a great job taking those wonderful pictures and adding some funny commentaries for their descriptions. 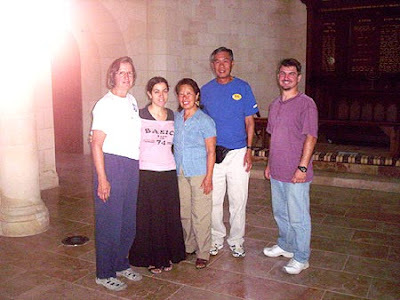 Hope to be able to join you some day in a pilgrimage to Israel.